New Yorker Sari Schorr served her apprenticeship in venues across her native city, culminating in a performance at the famous Carnegie Hall. She had some operatic training but, praise be, she decided to devote her formidable talents to blues and blues-rock. I first ’discovered’ Sari when I heard her cover of Black Betty off her first album, Force of Nature. So powerful was her interpretation of this classic that I bought the album and I am delighted to see that the follow up to that 2016 gem is now being released. 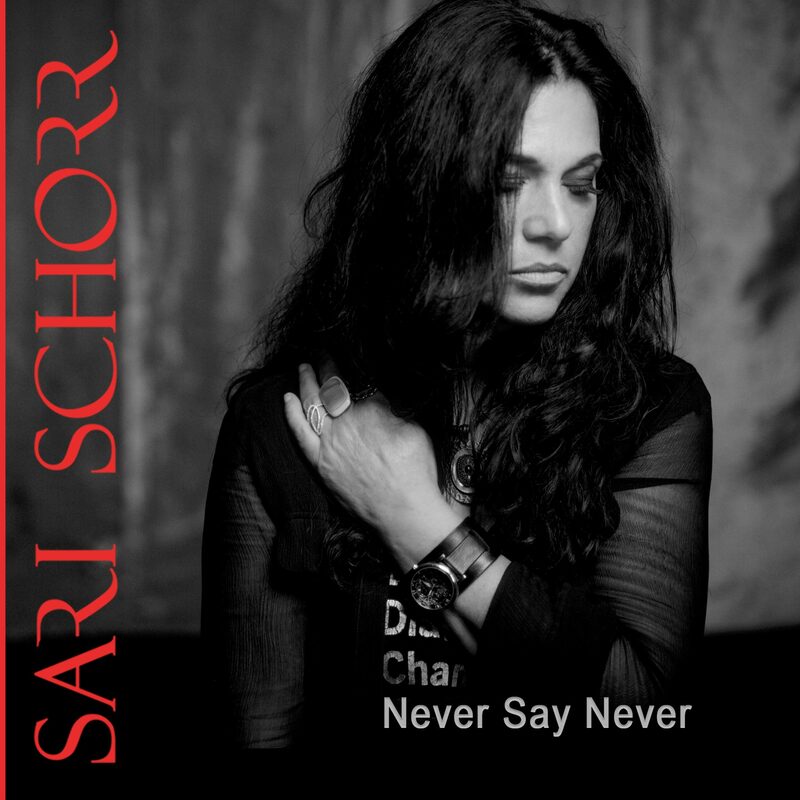 Never Say Never is eleven tracks of heaven…two are covers, the rest by Sari and her writing partners. The opening song, King Of Rock And Roll, may relate the oft-told story of the great Robert Johnson, but her vocals, coupled with a solid backing from the band and a great guitar solo from Ash Wilson, ensures that this familiar story is more than worth listening to. Thank You veers more to rock, but it has an edge that keeps it fresh and the wah-wah solo is a delight. If you could imagine Stone The Crows rocking out today, there you have it! Next up is a cover of the Bad Company classic, Ready For Love. Now anyone that takes on a song whose original vocalist could sing a phone book and make it sound good is brave indeed. Sari makes it work in a delicious way, with her vocal oozing a sensuality that suits the song admirably. It helps that it is backed by an instrumental interpretation that, using piano as well as guitar, pays due homage while giving it another, different life. The next song is autobiographical via her alto ego, Valentina. This is another rocky song with an infectious chorus and a sparkling guitar solo. The New Revolution follows, opening with a guitar sound reminiscent of Marc Bolan at his best…it doesn’t turn T-Rex however, as the Hammond warms and swells behind the vocals and takes us into a bluesy celebration of Martin Luther King Jr. and his legacy. Beautiful takes the blues ballad up to a new level and the emotion filled vocals will draw you in and share those poetic lyrics. The guitar solo conveys the same emotions with each carefully played note. Turn The Radio On, keeps the pace gentle as Sari regales us with a tale of finding the right man at the wrong time. It is, perhaps, the weakest song on the album, as it is a bit too ‘radio friendly’. I guess that shouldn’t be a fault, but it is the only track that I cannot use the label ‘unique’. It is still a good song and has a strong performance from the entire band. Maybe I’m Fooling is class and classic blues-rock with a great intro before Sari sings over a staccato drum and guitar and then it has a hook that is hookier than a tackle box (that’s a fishing analogy). A tiny tinge of country twang colours Back To LA, ironically. This is another made for radio soft rock song but with enough power in the vocal and the guitar to lift it above that medium’s usual fodder. Sari proves she is not afraid to take on the American constitution as Freedom rails against the meaningless loss of life due to accessibility of semi-automatic guns. Message aside, the song gives us another strong rock song with, this time, a hint of soul in the vocal and chorus. The guitar phrasing, backed by the Hammond is a delight. The final, and title track, Never Say Never is the second cover. It was written by Faces keyboard man Ian McLagan about the loss of his wife. Sari pays due deference to the sentiment and imbues it with such soulful emotion while the guitar and Hammond wash it with equal feeling. The subject is sad, yes, but it is also a celebration of the life she led and the life she shared. Take a vocalist of power, depth and the inherent ability to take you with her on a rollercoaster ride of emotions; add into the mix a band of such talent they would grace any stage…when forces such as these merge you get an album like this one. Simply brilliant from start to finish… and the good news? It gets better the more you listen to it as the individual performances reveal themselves. If you love blues, blues-rock or rock you will adore this record.